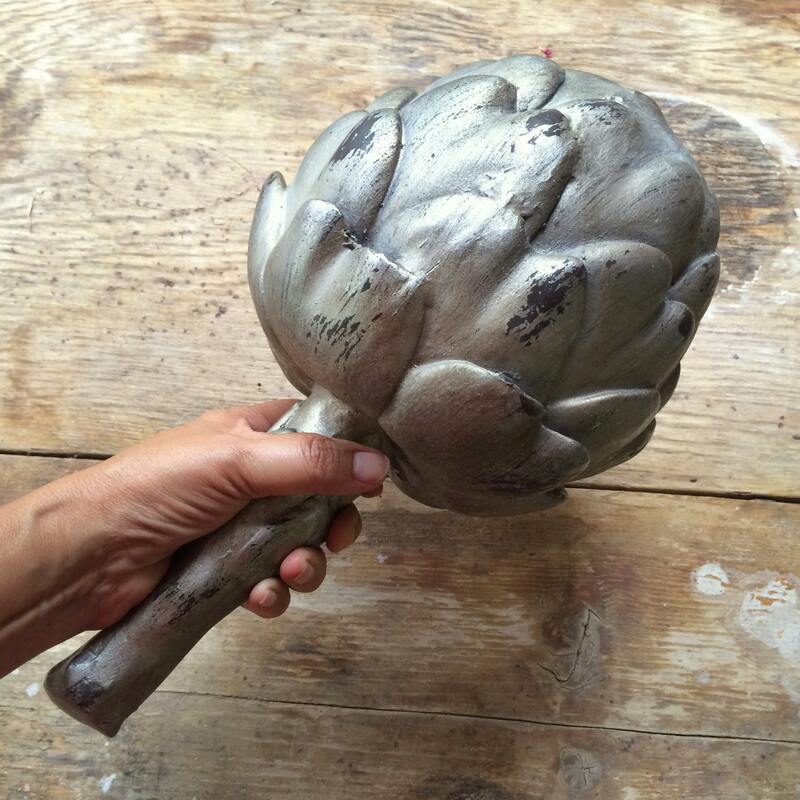 I love artichokes, and so I just had to have this completely unique oversized ceramic artichoke that's been painted a dark gray-brown-black undercoat with silver leaf on top. In 1635, the artichoke was chosen by French artist Abraham Bosse to symbolize taste in a series of paintings depicting the five senses. The painting shows a huge artichoke in a raised dish, with a lady stretching out her hand to remove the first leaf. 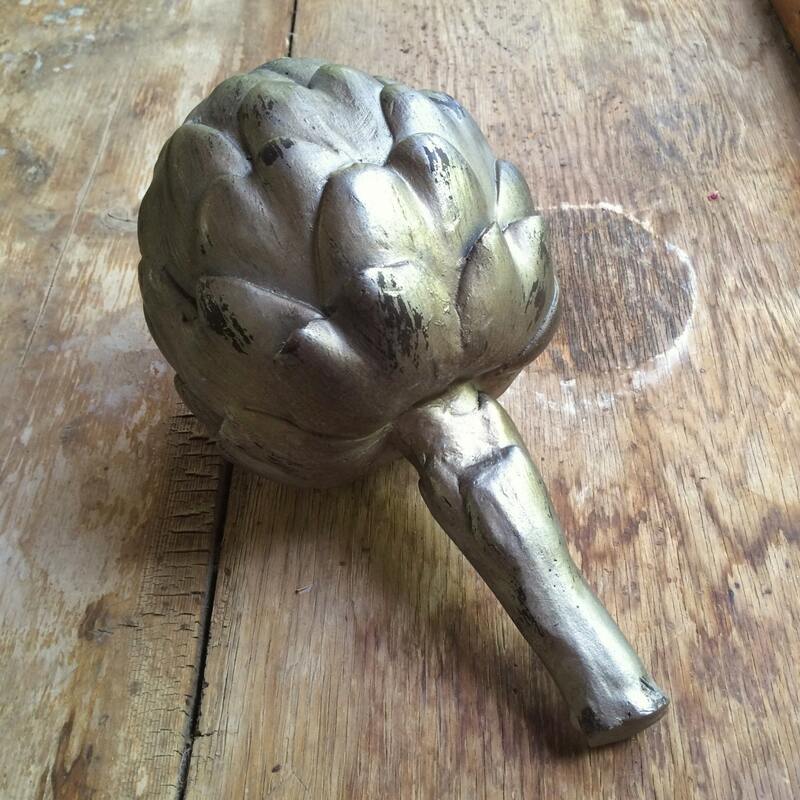 And so this oversized artichoke is so fitting to set on a rustic farm table, centerpiece for a feast, or on a mantel, with its depth and presence. Or, what a perfect gift for the health nut in your life!?! 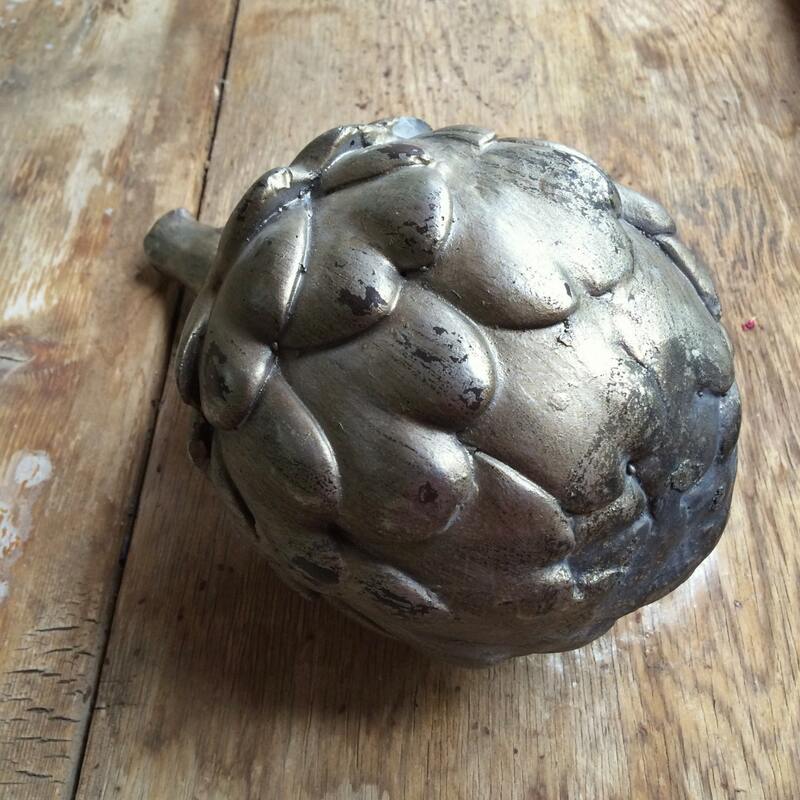 The piece is about 7" wide or 22-1/4" around taking a soft tape measure around artichoke's widest part, and is about 13-1/2" long from the tip to the bottom of the stem (although keep in mind that measuring a giant artichoke is more art than science). It weighs about 3 pounds and will be double-boxed, which accounts for the shipping cost. The silver leaf has worn off--the way silver and gold leaf do, which is really more like a peeling effect--in plenty of places, especially at the top, revealing the dark undercoat. There are spots where the edge of an artichoke leaf has chipped, all of which have been smoothed down for the most part and touched up to blend in. 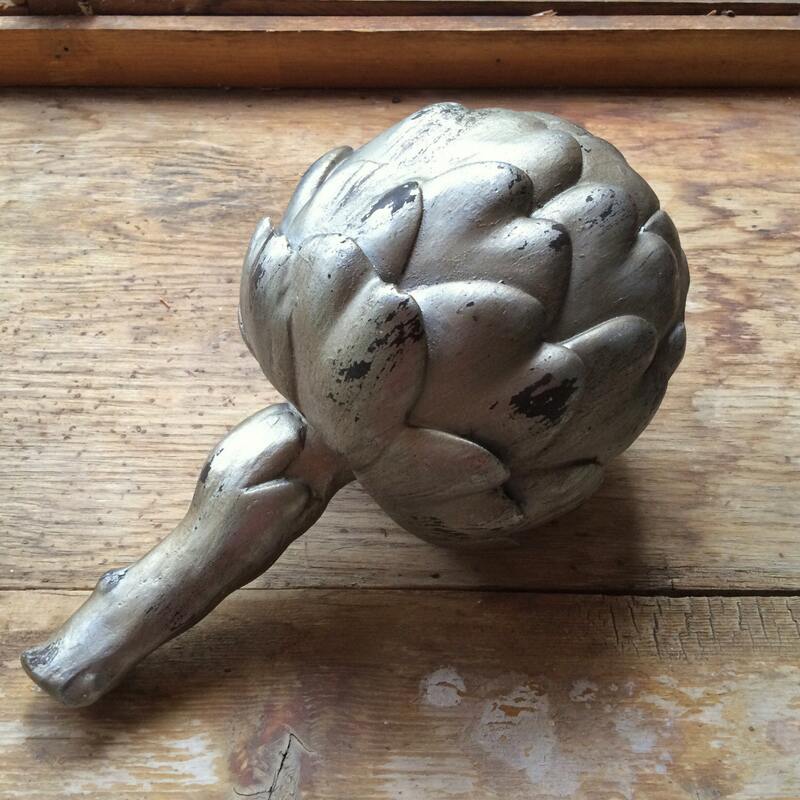 As with many ceramic pieces, you can hear the plug or small piece of ceramic that got left inside during the process of making the piece, and that will make a small noise if you shake or move the artichoke around. It's not an inner chip, but rather a natural part of hollow redware pottery-making. 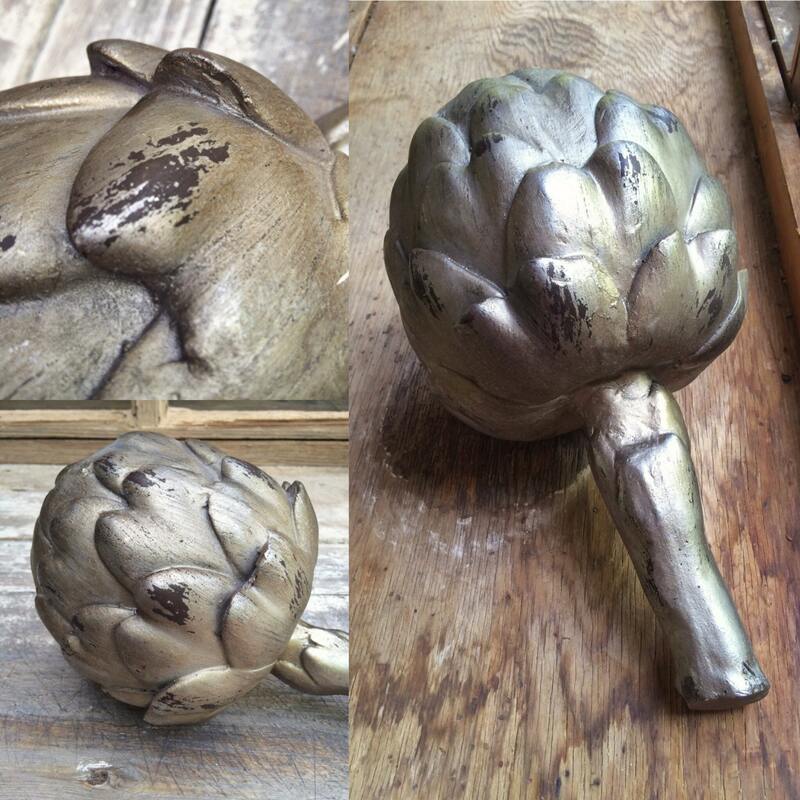 Bringing great taste to your home--the artichoke!